Gold: Portugal has the 7th largest supply of the world's gold, largely because it has a large naturally occurring supply of tungsten. Though officially neutral during World War II, Portugal sold tungsten to Germany and was paid with gold allegedly stolen from wealthy Jews. Cork: Portugal produces more than 50 per cent of the world's cork, which comes from the cork oak tree. Cork is harvested from a tree for the first time when it is 25 years old and every nine to ten years thereafter. Cork comes from the bark which is stripped from the trunk. The bark then regrows. While we think of cork primarily as wine stoppers, many other items (handbags, shoes, hats, for instance) are now made with cork. Pork: Pork from acorn-fed pigs are favored by the Portuguese as they find the flavor to be superior. Tourism: Tourism is the number one contributor to the Portuguese economy. Tile: Tile is an important element of architectural decor in both Portugal and Spain and is used liberally in both the interior and exterior of buildings, sometimes creating a large tile "mural," other times being used as a repetitive pattern. Tile has been used for five centuries in the area. Grapes: Portugal has 116 types of native grapes; Spain, 140. Olive Oil: Spain is the world's leading producer of olive oil, with approximately 975,000 tons sold per year. From 1,300 to 2000 olives are required to produce a quart of olive oil. Olive trees may live as long as 3,000 years. 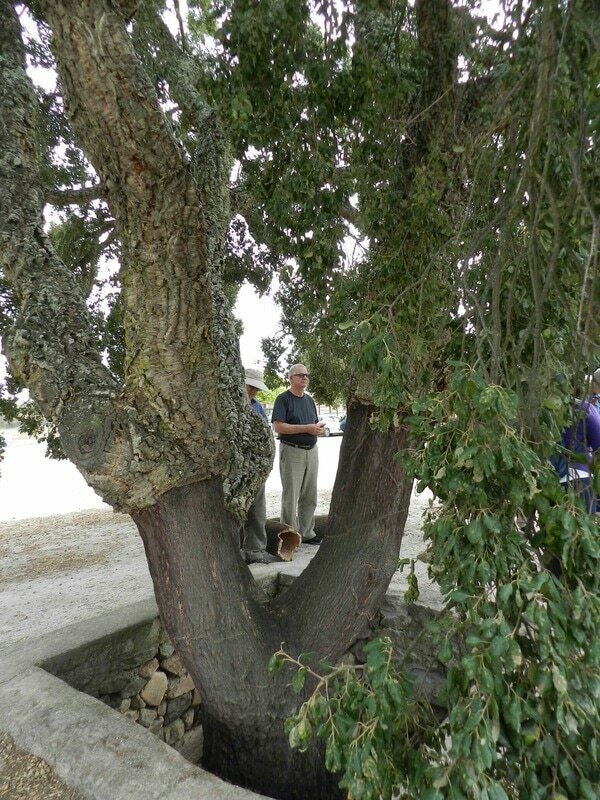 The average age of an olive tree in Spain is 200 years. Daily Schedule: A typical daily schedule in Spain is as follows: 10 AM-2 PM work; 2-5 PM lunch and siesta; 5-8 PM work; 8:30-10 PM dinner. Population: It is believed that Cordoba, Spain, with 500,000 inhabitants in the tenth century, was the second largest city in the world. Only Constantinople was larger. A cork oak tree with the cork bark stripped from the lower portion. 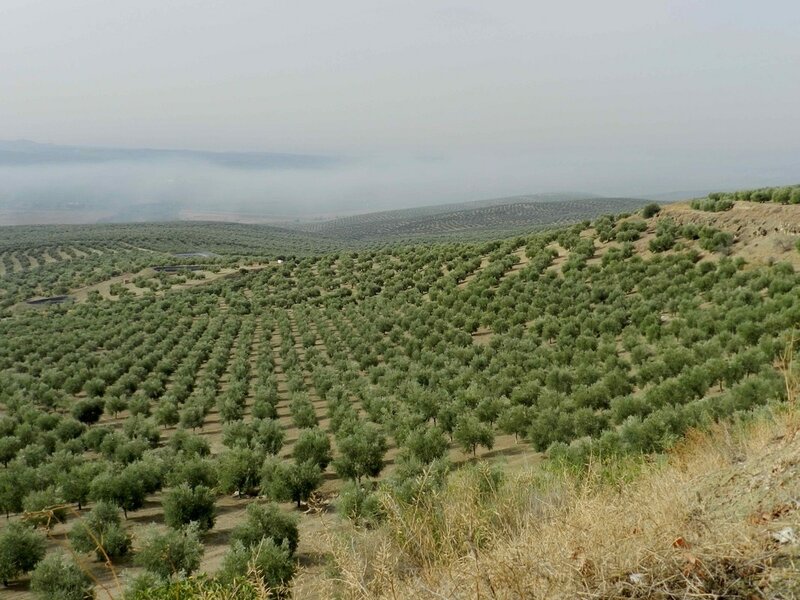 Olive groves as far as the eye can see. Many miles were filled with scenes like this as we rode through rural Spain.